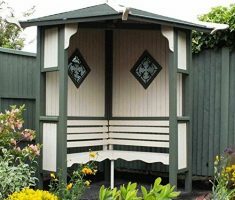 Having a wooden gazebo in your garden, especially in the UK is fast becoming a very popular choice for people who want to spend more time outdoors in their own garden. They can be bought in lots of shapes, styles, and sizes. 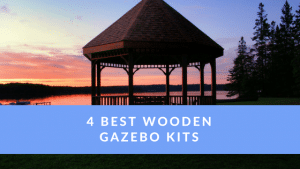 So what I’ve done to make choosing a wooden gazebo easier is to review my favourite 4 and you can easily check them out below. 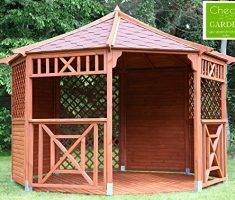 The Checo 10x10ft wooden gazebo is a cracking piece of kit and ideal for those of you that have the room for such a classy and solid structure. With 10 feet of covered, dry area it is perfect for adding furniture inside and on those hot sunny days, it is ideal for inviting friends and family around. It’s open sides, so is perfect to use as a hot tub gazebo. This also means that you don’t have to take down your hot tub after use either. The shingles are the roofing material you can see in the image. 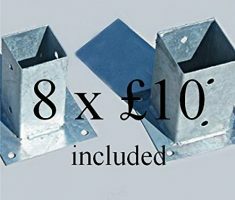 They offer a great value, are quick and easy to fit and last a lot longer than the traditional felt that is still used on sheds, etc. Hands down, this is one of the most solid and well-made gazebo kits on the list. Checo home and garden are a well-established company based in west Yorkshire. 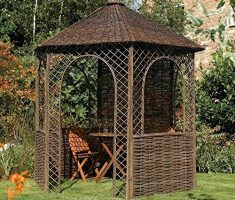 They are renowned for good quality and affordable garden goods and this gazebo is definitely one of them. I certainly recommend this product if you are looking for a strong outdoor garden gazebo that will last for a number of years and only needs minimal maintenance. Don’t forget when you visit Amazon you can decide if you want the shingle roof whilst also being able to select which colour too. 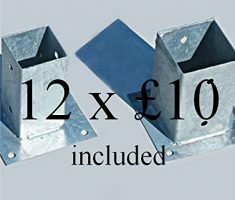 The measurements are 10ft x 10ft of internal space but the total size is 12ft x 12ft which includes the roof overhang. One word of caution, not about the gazebo but about the surface it will be standing on. 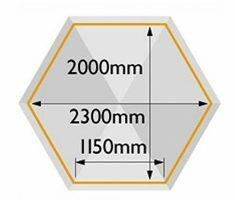 Please ensure that the surface is hard, level and flat as this will contribute to the sturdiness of the gazebo. At the bottom of the legs, you have metal feet that are attached and these have holes in where you can screw them into the ground to add extra stability. 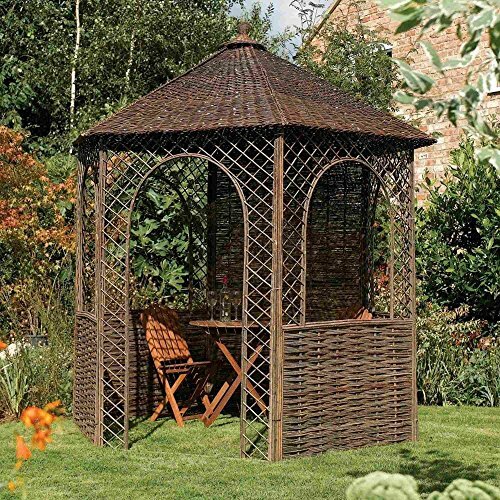 My next best is the Rowlinson willow gazebo, check it out below. 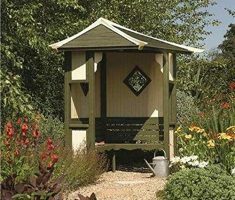 With measurements of 2.5m high, 2.5m wide and 1.73m deep, the Rowlinson Haven Corner Arbour is an attractively-designed arbor made specifically to fit into any right-angled corner in a garden. It is made of the highest and finest standard materials which are FSC-certified. This classic English-styled arbor is easy to assemble and disassemble. 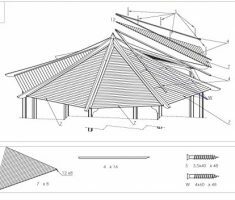 It is sturdy, resilient, and has a very solid, nice style roof. Everything that you see in the picture is included to help you replicate this elegant structure in your own garden. 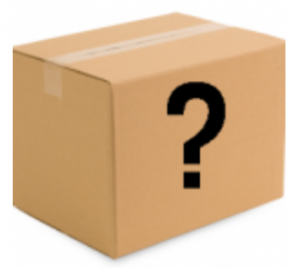 It is delivered on a large pallet and comes with a well detailed instructional manual to put it together. The included seat is very comfortable and can seat up to 4 people at once. 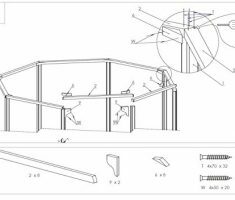 The arbor which has a treated timber finishing is light weighted and can be easily put together by 2 people. The Haven Corner Arbor would make a great addition to your garden as it brings you closer to nature. The seats are comfortable and make you feel like you are seated in a haven. It also shades you from the sunlight and gives you a perfect view to enjoy your garden beautiful scenery. It can be painted in any color of your choice but when painted in green and cream it blends well with nature. The arbor is made from pressure treated woods which do not rot or decay. The natural timber finishing ensures it is protected from attack by insects (termites) which ensure the arbor is long lasting. The arbor is FSC certified. It is made from the highest standard materials yet of great quality. 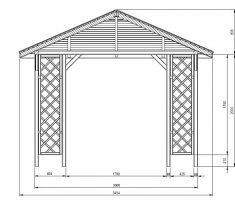 At just 113kg, the arbor is light-weighted and can be easily moved to any position of your choice after erecting, unlike other gazebos which tip the scale at over 500kg. The arbor is solid, sturdy and made from the finest materials which make it durable yet sold at an affordable price that is exceptional. Its attractive metal detailing and corner design will look appealing in any corner of your garden when painted to compliment your garden. The corner design of the arbor would fit perfectly into any right angle corner in your garden that is unused thereby saving outdoor space, especially if it’s a small garden. 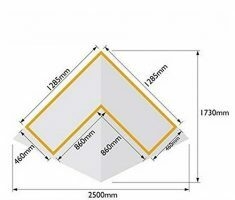 The corner arbor is manufactured by Rowlinson, a company known to produce quality, long-lasting products and have successfully made a name in the global market. They continue to provide excellent customer service and timely delivery. The Haven Corner is easy to assemble as it comes with full comprehensible instructions. It can be easily put up by two people and can be disassembled just as easily as it is assembled. If you like what you see, check it out on Amazon below. 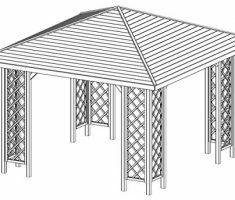 This gazebo kit gives you a protection from external elements around your garden. In fact, this is the best gazebo for high winds. What you would find most lovable is the timber-made roof. The back of the gazebo, when assembled, gives you privacy protection and a good cover from the wind. **The floor decking and roof shingles are not included. Check out the size of the gazebo below. 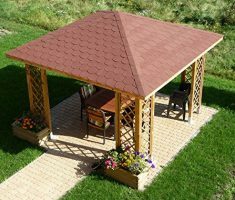 Unlike many other wooden garden gazebos, the Checo is more watertight. The wooden roof slats will keep water outside during considerable rain showers or drizzles. However, due to the open sides, it is safe to say users may need to leave during rain that is accompanied by gusty winds. This gazebo can be used for outdoor family/couple leisure bathing as the octagonal sides offer privacy protection. The inside of the gazebo is spacious and can easily hold a hot tub for 3 to 5 persons. The timber of this gazebo has undergone preservative treatment processes so it isn’t destroyed by woodworm, fungal decay, and microorganisms. This treatment makes the wood resistant to rots, thereby, making the overall gazebo longer-lasting. It is large enough to accommodate chairs and a table for a family of 3 to 6; whether for morning breakfast, for dad’s solitary time with the paper or for the kids as a play area in the middle of the garden. 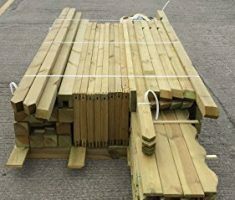 Made by Rowlinson Garden Products, a family business which has been selling outdoor, wooden furniture for over 80 years. The Rowlinson Willow Gazebo is a hexagonal outdoor gazebo made from the deciduous trees of the Salix genus. It has 6 lattice horseshoe-shaped sides that give this rustic looking shelter a real countryside look to it. It has a total of 4 side windows and a tall entrance. 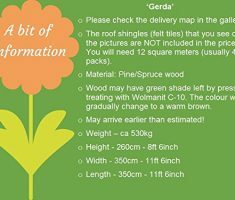 Below are what you’ll receive when you make an order/purchase of the Rowlinson Willow Gazebo from Amazon. Made of natural willow wood, the rustic design of this gazebo makes it look unique and adds pastoral aesthetics to your garden. 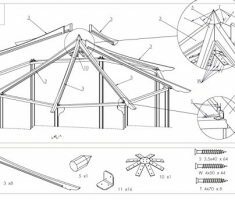 The Rowlinson Willow Gazebo can be assembled by two people in an hour. 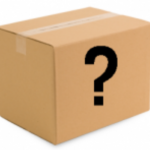 It comes with setup instructions and guide which makes it relatively easy to assemble. This willow gazebo can serve as a reliable go-to shelter during hot summer afternoons. It comes with windows and a doorway which is wide enough when moving in relaxation tables and chairs. This gazebo has enough of space to fit three people, either for family breakfast, afternoon relaxation. Another reason you should consider purchasing this gazebo is that it has a considerable strength to withstand wind. The product comes with fixing pegs and hooks which give it support during fairly windy days. The Rowlinson Willow gazebo needs to be taken down during periods of strong winds and in the winter. To make the willow more durable, users are advised to apply linseed oil before use.